The Global Volcanism Program has no activity reports for Talakmau. The Global Volcanism Program has no Weekly Reports available for Talakmau. The Global Volcanism Program has no Bulletin Reports available for Talakmau. Talakmau (also known as Talamau) is a massive compound volcano rising above the western coastal plain of Sumatra. The andesitic-dacitic volcano is constructed along a NE-SW line, rising to 2912 m, more than 700 m above its twin volcano Pasaman to the SW, which has its own adventive cone, Bukit Nilam, lying 3.4 km to the SW. Three craters along the same NE-SW trend occur at the summit of Talakmau; the NE-most and highest crater is filled by a lava dome. Reports of historical eruptions, including one with rumblings and "smoke" emission in 1937, are considered doubtful, but eruptive activity has occurred during the Holocene. Hantke G, 1939. Ubersicht uber die Vulkanische Tatigkeit vom Januar 1937 bis Marz 1938. Zeit Deut Geol Ges, 91: 160-168. Rock N M S, Aldiss D T, Aspden J A, Clarke M C G, Djunuddin A, Kartawa W, Miswar S J, Thompson R, Whandoyo, 1983. Geologic map of the Lubuksikaping quadrangle, Sumatra. Geol Res Devel Centre Indonesia, 1:250,000 map and 60 p text. There is no Deformation History data available for Talakmau. There is no Emissions History data available for Talakmau. Gunung Talakmau, a massive compound volcano rising above the western coastal plain of Sumatra, is seen here from the NE. The volcano was constructed along a NE-SW line and rises to 2912 m, more than 700 m above its twin volcano Pasaman to the SW. 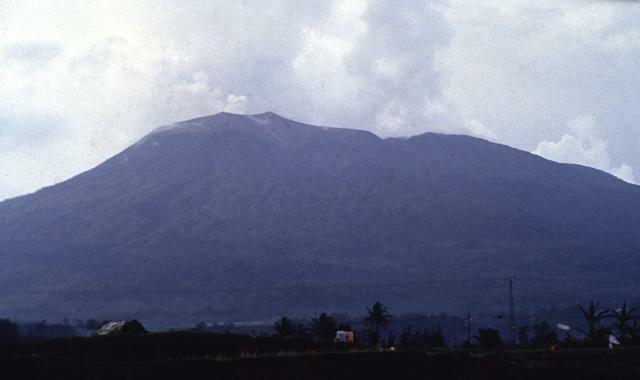 The NE-most and highest of three craters at the summit of Talakmau (left center) is filled by a lava dome. There are no samples for Talakmau in the Smithsonian's NMNH Department of Mineral Sciences Rock and Ore collection. Large Eruptions of Talakmau Information about large Quaternary eruptions (VEI >= 4) is cataloged in the Large Magnitude Explosive Volcanic Eruptions (LaMEVE) database of the Volcano Global Risk Identification and Analysis Project (VOGRIPA).